White chocolate was first developed after the Great War (World War I). It has grown in popularity since then and is often popular with people who don’t like regular chocolate. Familiar brands such as Nestle have popular lines of white chocolate such as the Milky Bar. White chocolate is a mixture of sugar, cocoa butter, and milk solids. 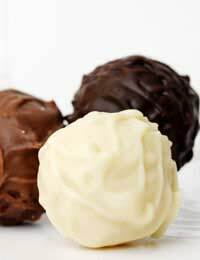 Unlike milk or dark chocolate, white chocolate doesn’t contain chocolate liquor or cocoa solids. However white chocolate has a similar texture to dark chocolate and milk chocolate. This is because cocoa butter has a low melting point and so all types of chocolate will remain solid at room temperature but will easily melt in the mouth. White chocolate can be used in the same way as milk or dark chocolate. It can be used to decorate cakes, and melted with dark chocolate to create a marble effect for cake decoration. In some countries, white chocolate is not classified as chocolate. This is because white chocolate contains neither cocoa solids nor chocolate liquor (cocoa mass). However, in the United States, white chocolate must be at least 20% cocoa butter, 14% milk solids, 3.5% milk fat, and less than 55% sugar or other sweeteners. The European Union has similar standards, except that there is no limit on sugar or sweeteners. Because white chocolate does not contain any cocoa solids, it also does not contain any caffeine. This means it can be eaten by people who cannot consume caffeine for medical reasons. Caffeine is only found in the cocoa solids and other ingredients of chocolate that give it its characteristic brown colour. Therefore dark chocolate contains the highest levels of caffeine, because it contains the largest amount of cocoa solids. The caffeine content of milk chocolate lies somewhere in between white and dark chocolate. ExceptionsSome white chocolate is not technically chocolate at all. White chocolate used for decorating or coating, known as confectioner's coating, is made from solid or hydrogenated vegetable fats. Therefore it contains nothing derived from cocoa. It is normally quite easy to tell that confectioners’ coating is not white chocolate; the colour is white, rather than the creamy colour of regular white chocolate. Also the taste is different as confectioners’ white chocolate lacks the cocoa butter flavour. White chocolate can be difficult to work with when baking cakes and biscuits. Occasionally when cocoa butter is melted it can split and create an oily compound (you can rectify this by re-emulsifying – melting a little butter or chocolate and whisking it all together). It’s important to avoid mixing the melted white chocolate with any water droplets as this can turn the mixture lumpy and grainy. It’s also worth watching out for evidence of browning. Some white chocolate brands can darken when baked. White chocolate is a delicious alternative to dark and milk chocolate. It contains no cocoa solids, therefore it contains no caffeine. White chocolate can be made into delicious chocolate bars and has a light, cocoa butter flavour. I cannot eat brown chocolate, milk or plain, as it causes terrible migraine. I can eat white chocolate with no problems but find it difficult to source any that hasn't got brown chocolate hiding somewhere inside, eg thorntons white chocolates, if you look close enough all of them are on a base of brown chocolate then coated in white chocolate. I've lost count of how many people have been excited because they've brought me a box of thorntons white chocolates but I have to give them back pointing out the brown chocolate hiding inside. Does anyone know where I can get white chocolates from beside milky bars and buttons or any others targeted towards children. White dairy crunch I know about but no one stocks it. I have bought it abroad with no problem. Abroad you can get bars of white chocolate with coconut, with hazelnuts, with strawberries and other ingredients, why not in this country? I am having problems sourcing some white chocolates that do not actually contain cocoa solids. My daughter reacts badly to caffeine but I would love to buy her some chocolates for her birthday. Can you please tell me where I would be able to buy some for her - preferably with lovely fillings.